The fraud of over ₹94 crore at the Pune-based Cosmos Co-operative Bank, involving the breach of the firewall in servers that authorise ATM transactions, has once again raised questions over the efficacy (the ability to produce a desired or intended result) and adequacy of security measures in Indian banks. True, the fraud at Cosmos Bank was part of a highly orchestrated (arranged with thorough planning or maneuvering) global fraud by cyber criminals. But the fact that the co-operative bank had fallen prey (target) to a massive attack that involved fraudsters compromising payment systems across the world, cannot be used as an excuse to downplay (to make something appear less important than it really is) the gravity (seriousness) of the incidence. 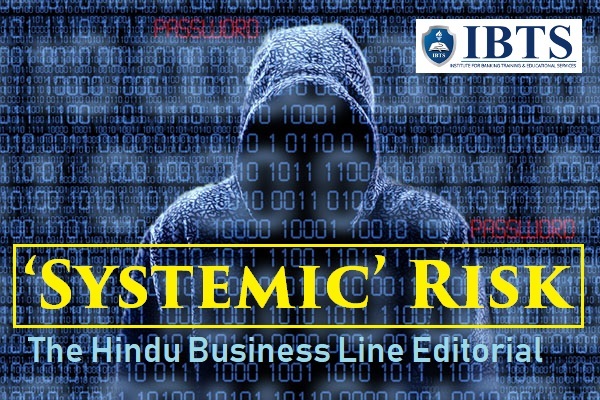 If anything it has laid bare the vulnerability of banks in India — not necessarily just the smaller banks — to such ingenious (cleverly and originally devised and well suited to its purpose) cyber-attacks. From what is known, at the heart of the Cosmos fraud was the setting up of a proxy switch to approve fake transactions. A switch normally authenticates the card information and also connects to the bank’s Core Banking Solution (CBS), before dispensing the cash at ATM. In the case of Cosmos, the fraudsters had developed a proxy switch that bypassed all these checks and authorised fraudulent transactions. The SWIFT system — a messaging network for securely transmitting instructions for financial transactions — was also compromised to transfer money fraudulently to banks outside. With data suggesting that co-operative banks and smaller financial institutions are not spending much on cyber security and security systems, it is clear that they are likely to fall prey to more such cyber-attacks. Earlier this year, City Union Bank’s SWIFT had come under attack, and nearly $2 million was transferred to three banks abroad. But it is not just smaller players that have been tardy (slow in action) in tightening their security systems. The gaping lapses in the control measures at larger commercial banks have been on the RBI’s radar for some time now. Shockingly, about 30 per cent of the 2 lakh-odd ATMs in the country still operate on Windows XP and other unsupported operating systems. Industry players suggest that around 40,000-odd ATM machines need immediate upgradation. Clearly, others — even large commercial banks — could fall prey to cyber-attacks. With the shift to digital in banking transactions, gaining pace, massive breaches can happen at multiple levels. Banks hence will have to up their ante (pay an amount of money in advance) to offer a more reliable and secure environment. Above all, there is an urgent need for spring cleaning (clean thoroughly) governance, risk management and processes at banks. At the core of nearly all frauds — even the ₹14,000-crore heist (robbery) at PNB — lies the involvement of insider officials who game the system. In case of co-operative banks in particular, it is time that the 2015 recommendations of the committee constituted by the RBI, on conversion of Urban Co-operative Banks into joint stock or small finance banks, issue of fresh licenses and constitution of boards of management are reviewed.